We are thrilled to announce our very first Arts Educator of the Month, Ms. Sheena Folkman. Sheena is an exceptional art teacher at LEARN 7 Elementary School . She works relentlessly every day to provide quality arts instruction to the Kindergarten – 5thgrade students that she serves on the West Side of Chicago. She is passionate, dedicated, innovative and is changing her students’ lives through the arts. We honor her commitment, talent and transformative work at her school. Sheena was nominated by her wife, Christina Folkman. Read her nomination below to learn more about the incredible work that she is doing in her role as art teacher. Congratulations, Ms. Sheena Folkman! Thank you for your important contributions to arts education. Why do you think this arts educator deserves to be nominated? Sheena takes art education to another level. She is referred to as “director” Folkman because her students are not just students, they are referred to as designers in her classroom. In only her second year teaching she has transformed the art program and enriched the lives of all of her students. Tell us how this arts educator has gone above and beyond to help students. Sheena ensures that her class is doing more than simply art production. Each unit starts with an art history lesson, focusing on a specific artist or art style. That lesson then ties into one of the elements of art, which is demonstrated through a project the designers complete for that unit. How would students describe this arts educator? Please share the innovative and creative ways that this educator is teaching the arts. Sheena makes sure to also speak to classroom teachers so she can connect to the curriculum as much as possible. 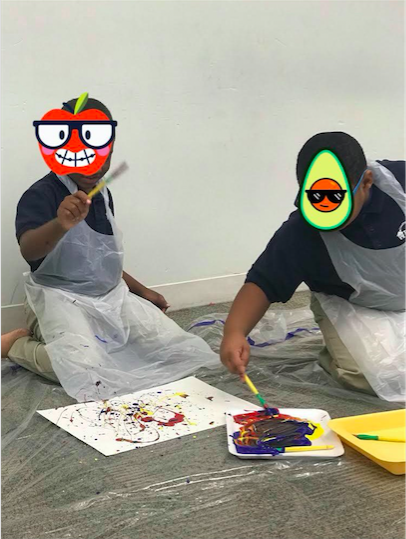 For example, when the 3rd grade read a book about Jackson Pollock, the art room was suddenly transformed into a Pollock-like studio! The floor was covered in plastic, desks and chairs were moved out of the way, and jazz played in the background as the designers learned to drop, splatter with, and tap their paintbrushes to create beautiful Pollock-inspired paintings. What distinguishes this arts educator from their peers? Sheena is constantly thinking of how to change up the media used, connect lessons to students’ interests, and generally goes above and beyond in her classroom.